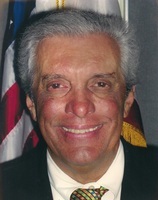 Joseph Gunn, executive director of the Los Angeles Police Commission in 1999. FURTHER MOVE that the City Ccl request the Police Commission to cease their enforcement against the City’s Downtown Center BID and its private patrol service, and any other BIDs until this matter has been reviewed by the City Ccl. This at least seems to explain a temporary pause in enforcement, although not a policy-based reason never to enforce the registration requirement and the other regulations. Furthermore, even a trip to the City Archives to copy the whole file left me lacking a definitive answer to the question of why no BID security provider was registered with the Police Commission. Also, I reported last week that no one in the City, either at the Police Commission or elsewhere, seemed to have a firm idea about why this was. 100 W. First Street. And isn’t this a lovely visual metaphor for the City government of Los Angeles? Well, last week the incredibly helpful Richard Tefank pulled a bunch of old Police Commission minutes out of storage for me and last Thursday I went over to 100 W. First Street to take a look at them. Most of the material was also in the Council file, but there were a couple new items that, while they don’t explain dispositively what happened, they suggest a likely hypothesis. Also, if this hypothesis is correct, it’s pretty clear that BID Patrols really ought to be registered and, furthermore, that the Police Commission has the right to investigate and regulate them. Why Aren’t BID Security Patrols Registered with the Los Angeles Police Commission? Recently I was reading the Los Angeles Municipal Code1 and came across LAMC 52.34, which discusses “private patrol services” and their employees, “street patrol officers.” The gist of it seems to be2 that private patrol service operators must register with the Police Commission, and also prove that their employees’ uniforms and badges don’t look too much like real police uniforms and badges. They’re also required to have a complaint process and submit lists of employees and some other things too. Well, as you can see from the photo above, and from innumerable other photos and videos I’ve obtained from the Hollywood BID Patrol, there is a real problem with BID Patrol officers looking like LAPD. Their uniforms are the same color, their badges are the same shape and color, and so on. Also, they’re famous for not having a complaint process, or at least not one that anyone can discover easily. The Andrews International BID Patrol isn’t the only one with this problem, either. The Media District‘s security vendor, Universal Protection Service, doesn’t seem to have one either. In fact, it was UPS Captain John Irigoyen‘s refusal to accept a complaint about two of his officers that inspired the establishment of this blog. The A/I BID Patrol is as guilty of this lapse as anyone. The fact that private patrol operators were required to file actual documents with a city agency means that copies would be available! So I fired off some public records requests to Richard Tefank, Executive Director of the Police Commission. He answered right away and told me they’d get right on it. What a relief to discover that Police Commission CPRA requests don’t have to go through the LAPD Discovery Section, which is so notoriously slow to respond that the City of LA has had to pay tens of thousands of dollars in court-imposed fines due to their tardiness. Mr. Tefank handed me off to an officer in the permits section, and he told me that none of the three BID security contractors I asked about; Andrews International, Universal Protection, and Streetplus3 were registered. How could this be, I wondered, given what seems like the plain language of the statute? The story turns out to be immensely complicated, and with lots of new documents.